Martin's best domestic finish have been thirds with Eduardo Garrido (1998 at Belmar) and Mark Kerins (1999 at Cleveland). 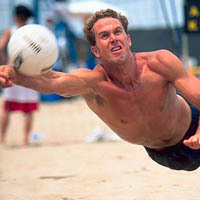 His brother (David) has played volleyball at both Pepperdine and Cal-Berkeley. Martin graduated with a degree in History from Cal-Santa Barbara in 1992. His hobbies include fishing, hunting, surfing and reading.